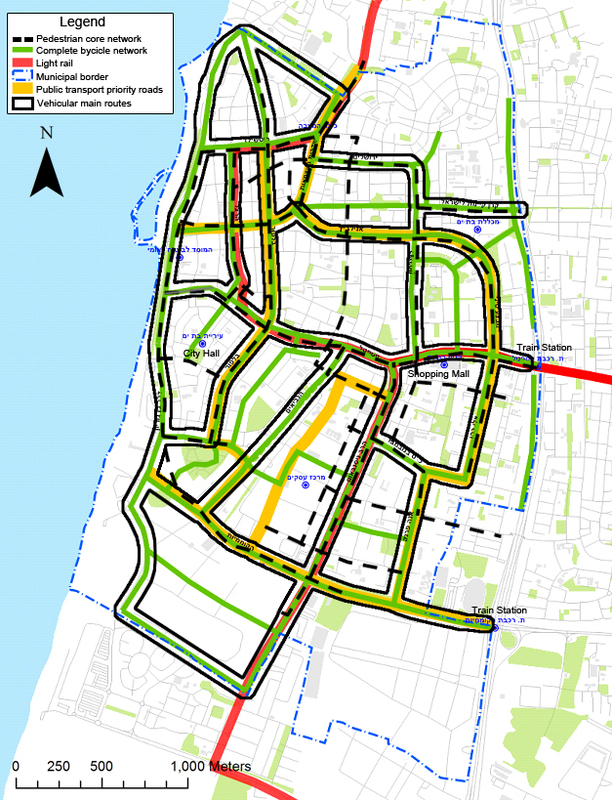 This post describes a planning project I’ve been involved with, in which we created an innovative pedestrian transportation plan for the city of Bat Yam in Israel. Bat Yam is an inner suburb in the Tel Aviv Metropolitan area where about 130,000 people live just south of the municipality of Tel Aviv. Besides the novel transportation plan, we have managed to publish an academic paper, adding to the global discussion on city and transporation planning. The paper was published in Geographic Analysis (together with Dr. Yodan Rofè and Prof. Itzhak Omer) in a special issue dedicated to Street Networks and Spatial Analysis, following a workshop in Dresden last year. A non-final version of the paper can be found here (or you can contact me for the final version). And now to the actual story itself. Transportation planning is changing. What used to be a concern with motorized vehicles only is evolving into a discipline dealing with multi-modal systems where priority is given to transit and non-motorized means of transport, chief among them being walking. Walking is important for several reasons: reducing reliance on motorized travel, which is rather costly, polluting and accident-prone; walking as part of a daily routine, promotes healthier life-style; and walkability can improve the economy of urban centers. Across the globe, effort are made to improve conditions for pedestrians. Known examples include New York City, Copenhagen and many more. Following this trend, The Israeli government has also published guidelines for streets design (here – in Hebrew). However, pedestrians in Israel are still at the bottom of the transportation and urban planning considerations. The city of Bat Yam in Israel has chosen to pioneer planning for pedestrians as an integral component of its transportation master plan. The transporation master plan for the city of Bat Yam includes all transportation means (i.e. private vehicles, parking, bicycles and so forth) and was led by PGL Transportation and Engineering Ltd. We were in charge of pedestrian transportation in the overall scheme and we hope that more cities and other public bodies will consider walking as an integral part of urban transportation. This project touches on one of the growing issues in urban planinng which is evidence-based design. This approach originated in the health and medical fields, and is now entering the realm of city planning. We managed to combine research and praxis and made a contibution towards a change in the area of urban planning. A few different subjects were joined together in this project – Space Syntax, pedestrian movement, general urban transportation and city developement. Besides analysing pedestrians movement, we had to address expected changes to the urban strcuture of Bat Yam in target year of the plan (2030). The major changes are expected to happen in the southern industrial zone of the city in addition to a new residential neighborhood on open land at the south-western edge of the city. These changes include modifications to the street network as well as land-use changes and plenty of new construction. The southern industrial zone is supposed to grow from current under-utilization to intensely built zone including lots of retail, office and residential high-rise buildings. We have constructed pedestrian movement models both for the current state of the city of Bat Yam, and for its future state in 2030. The future model included the changes expected to the street network and land-use. 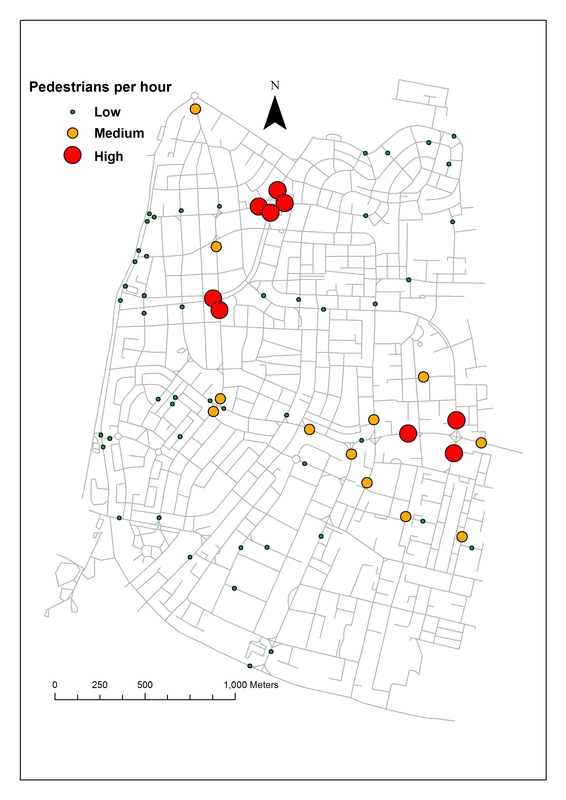 The model was constructed based on space syntax methodology and correlated based on pedestrian traffic counts in 69 street segments all over the city. The map of the traffic survey is shown below. I will not go into the entire method (which is explained in detail in the paper) – the large red points represent average movement volume of over 900 pedestrians per hour, the medium points represent average movement volume of over 430 pedestrians per hour, and the small points represent lower volumes. Three areas in the map have groupings of high movement points. These three areas have some kind of combination of high centrality with high presence of retail. The northern points are in the old center of the city (Memorial Square), the points further south are at the junction of the main commercial street (Balfour Street) and a major east-west street, and the points at the eastern edge are next to the (new) main entrance to the city and its largest shopping mall. Contrary to the municipality’s expectations, pedestrian movement along the beach front (on the western edge of the city) is relatively sparse. Most of the everyday pedestrian movement on a weekday probably is related to functional activity and not to leisure. This movement takes place mainly on the streets that define the epicenter of the city. 1. Pedestrian movement distribution can be explained mainly by spatial structure of the street network. Changes to this network structure are relatively rare, and therefore pedestrian movement distribution will be similar in the year 2030, and the main streets for pedestrian movement will not change in a fundamental way. 2. Because the model is not accurate it should be used with caution. Therefore, we have taken 20% of the streets where pedestrian movement volume is highest and they were declared as the pedestrian core network. This layer was then overlayed on other transportation layers – public transit, private vehicles and bicycles. This is the place where our model can have impact on the real world and on the future work of the municipality – by directing the focus to streets and places where conflicts among the various road users (pedestrians, bicycles, transit vehicles, and private cars) are expected. This conflict analysis can be used to develop a policy that favors pedestrians as well as to highlight areas where safety improvements are needed. The model also can enable an urban development policy that seeks to improve public space where the highest pedestrian movement rates are expected. A map of the Superimposed future pedestrian core network, public transit (including planned light rail), bicycle routes (planned), and major vehicular roads. As the map shows, there are few important streets, but these few streets carry a large share of the different kinds of transporation means and they are the places where conflicts among road users are expected. These streets deserve most of the planning efforts and investing in them has a large impact on the city and its residents. The entire paper can be downloaded from here.